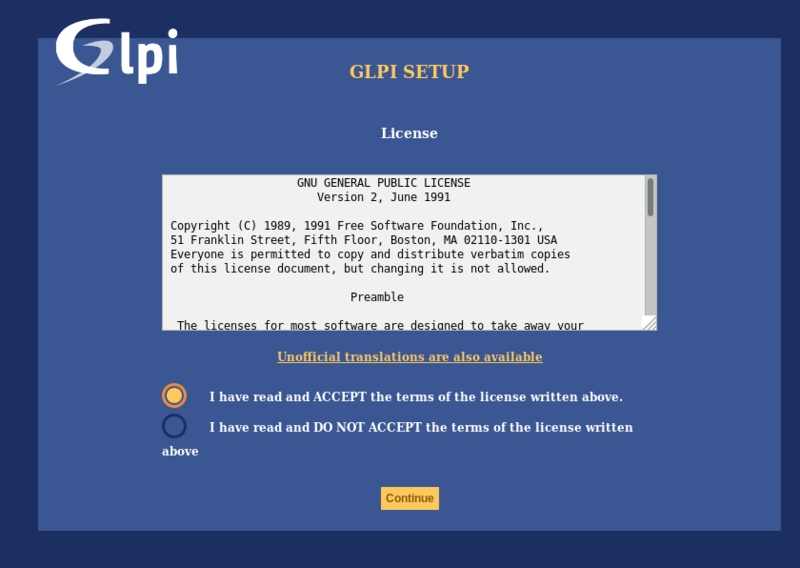 When GLPI is not installed; a step-by-step installation process begins. The first step will let you choose the installation language. Select your lang, and click validate. 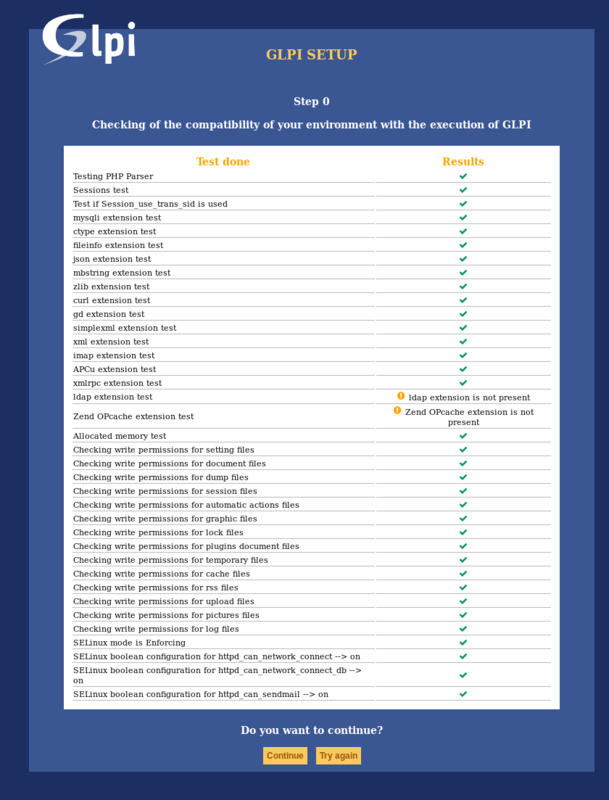 Usage of GLPI is subject to GNU license approval. Once licensing terms read and accepted, just validate the form. If you do not agree with licensing terms, it is not possible to continue installation process. 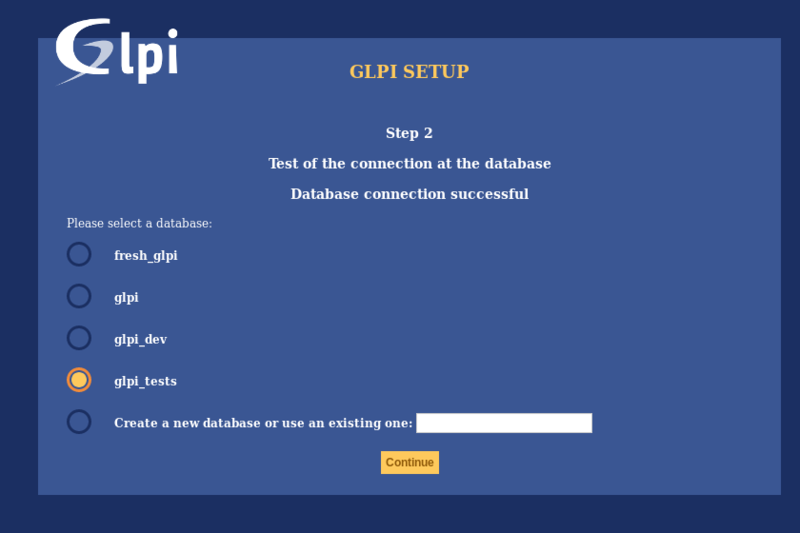 This screen allows to choose between a fresh GLPI installation or an update. This step will check if prerequisites are met. If thery’re not, it is not possible to continue and an explicit error message will tell you about what is wrong and what to do before trying again. Some prerequisites are optionals, it will be possible to continue installation event if thery’re not met. Database connection parameters are asked. MySQL password: enter user’s password. Once all fields are properly filled, validate the form. A first database connection is then established. If parameters are invalid, an error message will be displayed, and you’ll have to fix parameters and try again. 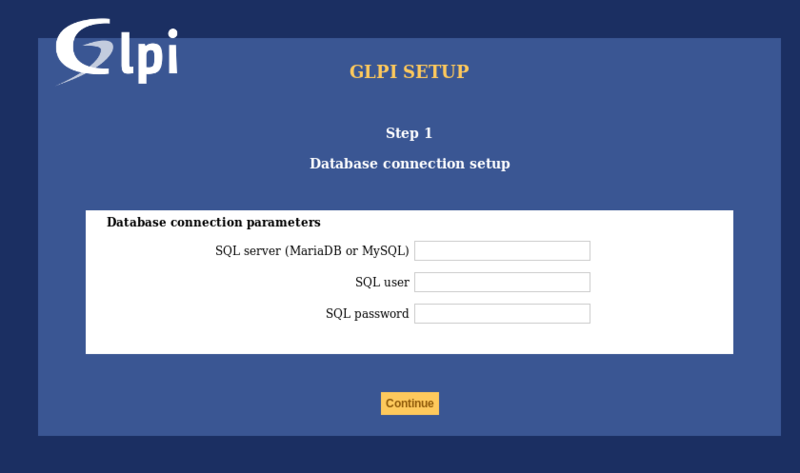 Once connection to the database server is OK, you have to create or choose the database you want for your GLPI and init it. Select this database in the displayed list. Validate to use. Selected database contents will be destroyed on installation. Choose Create a new database, enter the database name in the relevant field and then validate to create the base. SQL user must be able to create new database for this option to work. This step initializes the database with default values. If there is any error; pay attention to the displayed informations. 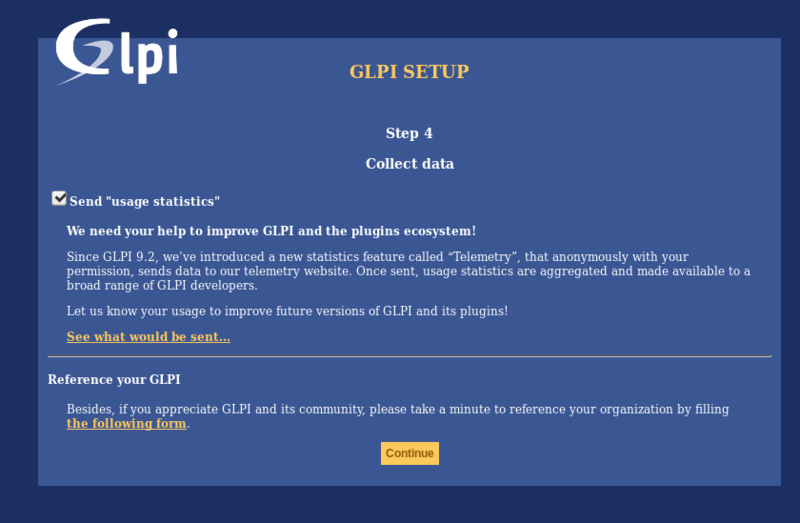 GLPI will ask you to share some Telemetry informations and to register. This is not mandatory. This step presents a summary of the installation and give created users list. Please pay attention to those informations and validate to go to the app. For obvious security concerns, you’ll have to delete or edit those accounts. Before removing the glpi account, please make sure you have created another user with super-admin profile.